Posted September 26, 2013 by Staff Writer & filed under City Hub. Paul McPhun is the Executive Director of Médecins Sans Frontières, an independent international organisation dedicated to medical humanitarian aid. Julie Bishop, Australia’s new Foreign Minister faced perhaps the most important first week on the job of any previous incumbent for a generation. Ms Bishop has travelled to New York to participate in United Nations Security Council deliberations seeking to resolve the terrible conflict in Syria, and in particular ensure that chemical weapons will play no further role in that conflict. There has been much diplomatic discussion focused on the recent chemical weapons attack in al Ghouta, eastern Damascus. 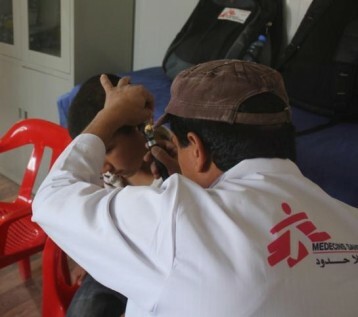 Médecins Sans Frontières has been supporting a network of doctors working in this area and reported the harrowing effects of that attack on the patients treated with our assistance. However, these victims represent only a small proportion of the thousands treated by Médecins Sans Frontières’ own hospitals operating in opposition controlled areas for over a year, dealing with the massive impact that the conflict is having on civilians both in terms of the violence of war and the complete collapse of the Syrian health system. The focus of the diplomatic community on finding a non-violent solution to the threat of further chemical weapon use is laudable but will do nothing to alleviate the suffering of these civilians who now live under bombardment by conventional weapons and without access to healthcare which is killing hundreds every week. This week, Medecins Sans Frontiers coordinator in Syria, Dr Jean-Hervé Bradol has called on the international community to help end ‘the humanitarian blockade crippling Syrians living in opposition-held areas’. For the past two years, the bulk of international humanitarian aid – provided by the UN and the International Committee of the Red Cross (ICRC) – has been channelled through Damascus and distributed according to the whim of the government. This same government prohibits the provision of medical assistance to people living in opposition-held areas. Just a few days ago, a field hospital in al Bab in northern Syria, was bombed by the Syrian airforce, killing nine patients and two medical staff. Across the country some members of the armed opposition have also been involved in criminal behaviour against ordinary Syrians, aid workers, journalists and prisoners of war. While other members of the opposition may disavow these acts, the abuses persist, and continue to hinder the distribution of humanitarian aid where it is already cruelly lacking. Ms Bishop should continue with this humanitarian objective, and do all in her power to ensure that the humanitarian blockade crippling Syrians living in opposition-held areas is lifted.